If you are in need of Carpet Cleaning for your home, Heaven’s Best Carpet Cleaning has the Best Residential Carpet Cleaning Specialists in Birmingham, AL. A clean, fresh smelling home can make just about anyone feel good. And if you are looking for an easy way to perk up your home and give a fresh facelift, calling a professional to have your carpets cleaned is an easy way to achieve this. Heaven’s Best Carpet & Upholstery Cleaning not only cleans carpets, but we also clean upholstery, tile & grout, and hardwood floors. Along with cleaning and sanitizing your floors, we use a unique solution with a pleasant citrus scent that will make your house smell great. Other carpet cleaners charge extra for deodorizer. At Heaven’s Best, we believe that it is just part of the cleaning process. Therefore, deodorizer is always FREE. Along with providing our Fresh Citrus Deodorizer for FREE, we have great rates and our service is an excellent value for your money. So, having a clean fresh home will not break the bank. Another great benefit to using Heaven’s Best is that our process is low-moisture. What this means is that you will not have to wait days or even hours for your carpets to dry. You won’t have to tip toe around after we clean. Our process will thoroughly clean your carpet and be dry in about 1 hour. You will be able to get on with your life and activities in no time. We also take pride in the fact that our firm is IICRC certified by the premier Institute of Inspection, Cleaning & Restoration Certification. The IICRC sets the standard in the US for how carpets and textiles should be properly cleaned. Our technicians are IICRC trained and tested to insure that they know what they are doing when they come into your home. You don’t have to worry when you invite a Heaven’s Best Carpet Cleaning Technician into your home. Along with IICRC certification, our firm has a $2 million insurance policy to ensure that we do not damage anything in your home. We promise and back up our promises with our 30 day guarantee. If a spot returns, so will we. 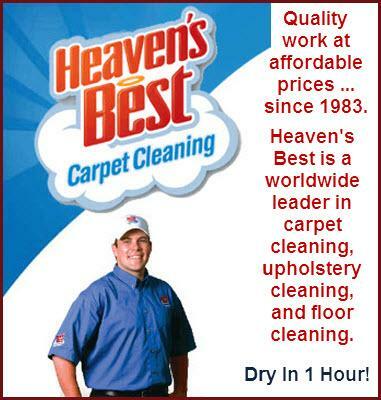 Why not call Heaven’s Best at (205) 618-9150 to schedule a Carpet Cleaning? Your home will look and smell great! Don’t wait any longer; call the Best Residential Carpet Cleaning Specialists in Birmingham, AL today.